Caviar d’aubergine is a typical French dish, but it does not mean it includes caviar in its ingredient list, it’s basically a vegan dish if you don’t add the parmesan on top. 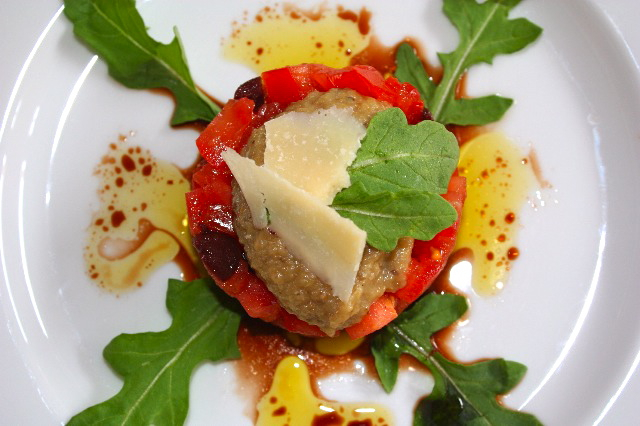 Eggplant caviar is made out of eggplants roasted in the oven and reduced into a purée with herbs and garlic. Of course there are various variations of eggplant caviar. You can add herbes de Provence instead of just thyme, or lavender. I’ve had close friends who don’t like eggplants and loved this dish, so I guess it’s a way to initiate the non eggplant lovers to this wonderful vegetable. Tartare describes a way of preparing ingredients, like you have tuna tartar, and salmon tartar where the fishes have been cut in tiny cubes, then marinated. In this case, the tomato is peeled, cut in small cubes, marinated with herbs and olives and finally placed in the refrigerator for about an hour. So that is called a tartare. You can make nice presentations with the contrasts of colors, the red, the green, the white and light brown, it looks very summery and fresh. Being such a light and pretty dish, with contrasts of flavors and textures, you can serve it as a light appetizer, it will put you or your guests en appétit (in appetite) for the next courses, it’s screaming, I’m hungry now and I want more! I love this dish, it’s fresh, light, full of flavors and textures and so far everyone who tasted loved it too. Ca sent les vacances! Cut eggplants in two lenghtwise. Using a knife, make three incisions from top to bottom of eggplant. Sprinkle with thyme, salt and pepper. Place on top of parchment paper, placing the flat surface down. Cook in a pre-heated oven at 390F for about 30 minutes or until eggplants are soft. Remove from oven and let cool. Using a spoon, remove eggplant flesh making sure to drain the water and remove the peel. Place in a mixing bowl. Using a blender, blend eggplant with garlic, olive oil, lemon juice, salt and pepper. Let it cool. Bring a pot of water to a boil, and add tomatoes for about 10 seconds, drain, peel, remove the seeds and cut tomatoes in small cubes. Remove excess water. Refrigerate tomatoes for about 30 minutes. Mix vinaigrette ingredients all together and add to tomatoes. Spare some vinaigrette to add at the end. Mix well. Using a rind, place tomatoes layer on your plate, then spoon one tbs of eggplant caviar on top, add shaved parmesan and arugula. This entry was posted by silvia on April 4, 2010 at 10:59 pm, and is filed under Appetizers, Vegetables, Vegetarian - dairy. Follow any responses to this post through RSS 2.0.You can leave a response or trackback from your own site. what a refreshing looking appetizer! Oh! I like this. I discovered how good eggplant is when roasted and pureed. Beautifully presented. The playful “caviar” is the kind of creative cooking I find inspirational. Great use of the arugula leaves. talk about a huge WOW! girl this is amazing….you are a true food artist, wish you could come here and make my table make them say WOW! gorgeous presentation! A dish like this just goes to prove that vegetarian food can be SO delicious and creative. Beautiful! Beautiful presented. This is very healthy recipe. Oh my, I could have this devoured in a manner of minutes! Of course, it is so pretty, I suppose it would be best savored, huh? I love this. Totally need to make it ASAP! Eggplant caviar is my all-time favorite! 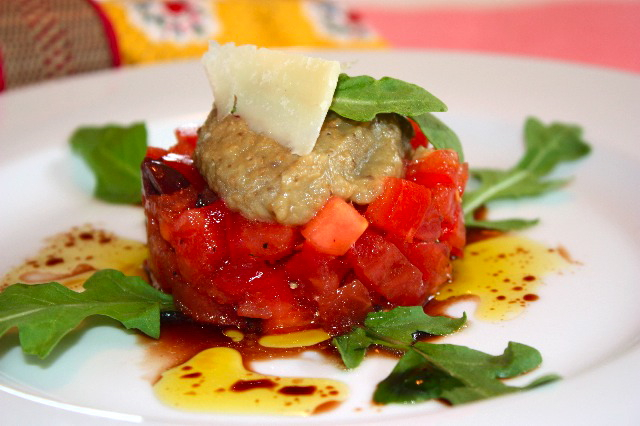 It sounds so wonderful atop this delicious tomato tartare! What a beautiful presentation. Your pictures are fabulous! Looks delicious and beautifully presented! I wouldn’t know where to begin, it looks like a work of art. Such beautiful dish! I have no idea where to begin as well or I might need to use my hand to dig in. haha…. This is a beautiful dish. Now that it’s warming up I’ve been craving eggplant too. Love the idea of “caviar” vegetarian style. That looks very fancy and yummy, impressive. Beautiful pictures too. What a lovely summer appitizer! So elegant, but still light. I can;t wait for good fresh local tomatoes so I can make this. this looks so refreshing with its use of vegetables and herbs. the melody of color and flavors looks so inviting!